August 31, 2016, 1:57 p.m.
Last Thursday, a Domino&apos;s franchise in Auckland, New Zealand, delivered a pizza via drone. While it was just a test run, the chain hopes to establish a regular drone delivery service by late 2016 from a select location in New Zealand, making the company the first to achieve what other firms, such as Amazon, have been working on for years. According to a new poll from YouGov, however, many Americans are skeptical of airborne pizza. It&apos;s all pie in the sky, they might say. 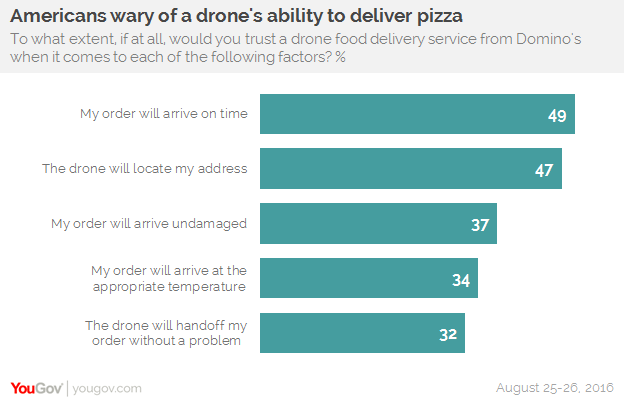 Indeed, only 35% of people aged 18 and older think drones are capable of delivering pizza without a hitch. More specifically, only 32% of people trust that a drone will actually let go of the food when it&apos;s supposed to, while a mere 34% anticipate that their order will arrive at the right temperature. On the more trusting side of the spectrum, nearly half of all adults indicate that they&apos;d expect their order to arrive on time and at the correct address. 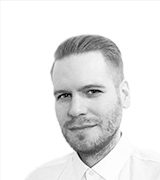 Millennials aged 18-34, it&apos;s worth noting, demonstrated higher levels of trust in each aspect of the delivery process than older age groups. When asked to state their level of trust for a hypothetical drone delivery service run by Amazon, 38% of people said they would trust it. For the United States Postal Service, that number came in at 23%, followed by Google (20%) and Walmart (19%). Overall, 39% of people said they would not trust a drone-based delivery system to work, regardless of the company behind it. This suggests that despite the advances in drone technology, and relaxation of regulations by the Federal Aviation Administration, companies may have to target young people eager to try new technology to get a drone delivery service off the ground.